I didn’t think fishing could get any worse than the three tournaments in July but last Sunday West Point proved me wrong. I thought I had a really bad day until weigh-in. At the Flint River Bass Club July tournament 10 members and guests fished from 6:00 AM to 2:00 PM to land 11 keeper bass weighing about 13 pounds. There were six spotted bass longer than the 12-inch size limit and five largemouth over their 14 inch limit. No one had a limit and there two people didn’t have a keeper. I won with two fish weighing 2.40 pounds, Wes Delay came in second with two at 2.30 pounds, third was guests Glen Holcomb with one weighing 1.86 and that was big fish. Alex Gober was fourth with one weighing 1.71 pounds. I started with a buzzbait near the ramp, something that has worked in the past but I never got a bite. After 30 frustrating minutes I ran about five miles down the lake to some trees in the water on a steep bank, the kind of place a friend told me it was easy to catch a limit of small keepers. At 6:40 I threw a jig head worm to a small pine top in about four feet of water and when I tightened up my line it was moving toward the boat. I set the hook and landed a 13-inch spotted bass and knew at least I would not zero. That was a largemouth weighing over a pound and a half and it hit in 22 feet of water. I decided I needed to fish deep and tried a variety of places but got no bites. At noon I stopped on another long point with some rocks out in 20 to 30 feet of water and quickly caught four short bass, all under the size limit. I ended the day fishing the brush pile where I had caught the largemouth, hoping another one had moved to it to feed, but got no more bites. It was so hot by 9:00 I realized I was fishing places where I could sit in the shade or in the little breeze, not really fishing where I thought the fish should be. I wish we still had night tournaments when it is cooler, boat traffic is much less and the fish bite better! This entry was posted in Bass Fishing, Tournament Fishing on July 21, 2017 by ronniegarrison. Damming Dearing Branch was always a favorite summer activity when I was growing up. The branch entered our farm in the woods that ran along the edge of our big hay field. It came under a fence at the adjoining property line and left the other side of our land, running under another fence and going into a culvert under Iron Hill Road. The woods were about a quarter mile wide from our field to the pasture on the other side at Rodgers’ Dairy. Right where it first hit our woods it was about eight feet wide and the area around it was flat and sandy. In other sections it had cut deep and was only three or four feet wide with two feet of water in that ditch area. The sandy area was only a few inches deep unless there had been a big rain. About 20 yards past the fence on the upper end two big trees squeezed the water into a narrow gap three feet wide. We wanted our own private swimming hole and those two trees made a perfect place for a dam. The first time we tried we quickly found that no matter how fast we shoveled sand between the trees it just washed away with the current. I don’t know where we got the idea for sand bags, probably from reading books, but we got croaker feed sacks from the barn and filled them with sand. That worked. We would dig sand from the bottom of the shallow area to fill the sacks and struggle to drag them to the trees. As the water rose at the gap between the trees it would start running around either side so we extended the dam out to the sides. Our best effort was one summer when we got an old cross tie and drug it across the field and through the woods to the dam site. It took all the strength three 12-year-olds could muster but we got it there and in place. It made a great base. We then started digging sand and filling sacks. That summer we had a pool almost four feet deep, coming about chest high on us. We could almost swim in our 20-foot-wide, 20-foot-long private pool. Since it was down in the woods we didn’t bother with bathing suites, we just wore what we were born with. Skinny dipping was so exhilarating! Every summer our dams would wash away with the first big rain and we learned a lesson about the power of moving water. But the cross tie was such a good base it held up for a couple of months. After a very big rain it, too, washed enough to turn the cross tie sideways, moving it from the trees and destroyed out pool. But that was a memorable summer. This entry was posted in Fishing Ramblings - My Fishing Blog on July 19, 2017 by ronniegarrison. My mother loved flowers. Although daddy thought planting anything you could not eat was a waste of time, he made sure she had a nice flower bed that ran between our side yard and the field on the other side. It was about 200 feet long and ten feet wide and contained a huge variety of flowers, including annuals and perennials. There were also a few blooming bushes, like the Rose of Sharon that grew right at the end of the bed closest to the house. This was her favorite and she thought it was a biblical flower. But it was really a Hibiscus syriacus, a deciduous flowering shrub native to east Asia. I always wanted one in my yard and thanks to my mother-in-law I do. There is a big one at her house and she gave me one of the sprouts that grew up around it. I planted it near my woodshed but it had a rough life. A big limb fell and broke it to the ground the third year it grew. But it recovered and was about six feet high when a fire in my woodshed killed the trees around it and, when they were cut down, it was again broken to the ground. But it recovered again and is now about ten feet tall and covered with blooms. For years I had daddy’s attitude and planted only edible things. But then some of my mama came out and I started planting some flowers. I was never real serious about it, planting marigolds around my tomatoes and some impatiens in a shady bed near my carport, but I did try to have a bed similar to mama’s. I have always liked wild flowers or flowers growing wild in ditches and old home places. When I worked as transportation director and rode all the back roads of Pike County checking bus routes I kept a shovel and bucket in my truck. If I saw a flower in the ditch I would often stop and dig it up and take it home. I made a long, narrow bed across my back yard between the woods and yard, something like my mother had where I grew up. It contained several kinds of daffodils, many tiger lilies, another of my favorites, and one of my favorites growing up, butterfly bushes. Mom never had butterfly bushes but they grew in ditches around my house. I’m still not sure what they are, and they may just be weeds, but some nurseries sell them. They are small and have bright orange feathery flowers. I found several to bring home. Tiger lilies, or what we called wild lilies, grew everywhere and I had a bunch of them. These bright orange striped flowering plants can be grown from the roots or from seed and they make a great border plant. A rare flower I saw in the woods sometimes is a pretty, white cup-shaped flower on short stem. The one flower on a plant stands out under trees. I found out they are wood anemones. I tried bringing a few home, but they are hard to find and do not transplant well, so I never had much success with them. One plant I had way too much success with and should never be planted in your yard is wisteria. I planted a small piece of root by an eight-inch-thick oak tree by my woodshed and another in the edge of the yard. I let the one by the wood shed grow up the tree and kept the one in the yard trimmed, trying to make it umbrella shaped, with hanging bloom clusters. Both were a big mistake. Within a few years the vine growing up the oak tree was thicker than the tree and all the trees around it were covered in vines from the roots spreading from the original. The one in the edge of the yard spread with roots just under the ground everywhere and I have to cut them away from my garage and yard light pole. They got so thick on the pole they covered the light until you could hardly tell when it came on. And it almost killed the fig bush daddy brought me to plant by the garage. Although the grape like clusters of lavender to purple flowers are pretty, I wish I had never brought this one home! Daffodils are pretty and easy to transplant and grow. They line the edge of my flower bed and start blooming before anything else. They are often the only color in late February when everything else is drab browns and grays. The splash of yellow reminds me spring and good fishing is close. Daddy did like his fresh fruit. We had a huge fig bush by the side door and he planted peach, apple, pear and Japanese Persimmon. And one of my favorites was the overhead scuppernong arbor. I loved standing in the shade under it and reaching up to pick the golden fruit. Somewhere I tasted Niagara Grapes. You cannot buy them in the store, they do not ship well, but they are delicious. I made trellises around my back yard and planted three Niagara and three Concord grape vines. Home grown Concord grapes taste better than any you can buy, like most anything else you grow. I was warned we are too far south for those varieties to grow successfully. My vines produced abundant clusters of grapes for about five years then died. Now wisteria covers the old trellises. But they surely were good when I had them. Fruit trees take a lot of work, and if you don’t spray them they will not produce. My plum tree gets a disease that makes the fruit rot when it first starts growing and I always forget to spray it in the winter when it is dormant. And my pear trees got what I was told was “phony pear” disease, causing the trees to grow tiny fruit like a Bradford pear. Maybe I should stick with flowers. This entry was posted in Fishing Ramblings - My Fishing Blog on July 10, 2017 by ronniegarrison. By stocking Florida strain bass in the big Alabama lake, local anglers are hopeful Guntersville can be restored to former glory as one of the top bass lakes in the nation. Captain Mike Carter and wife Sharon, organizers of the Lake Guntersville Conservation Group, held a meeting in Scottsboro this past Sunday in which Carter advanced plans to go ahead with state-approved stocking of 50,000 Florida strain largemouth bass fingerlings into the north end of the lake next May. The stocking will be entirely financed by local communities and private donors, with no state tax or license money involved, Carter said. He’s hopeful the infusion of new bass stocks will help to restore the lake to former glory as a fishing lake–it was once ranked as the top bass lake in the nation, but has dropped dramatically in recent years in the rankings. Carter said he had hoped to get the stocking underway by fall to see earlier returns of catchable size fish, which will require at least two to three years from the stocking date, but the ADCNR district biologist Keith Floyd recommended that the stocking take place in late spring, when he said research indicates the tiny largemouths would have a better chance of not being eaten by other fish, and would also have a better chance to learn to feed themselves without immediately having to deal with the cold water of winter. Carter said the group plans to put donated funds into a tax-deductable account, so that private parties who donate can get a tax deduction for their funding. Carter said the fish would be stocked in the shallows of a number of feeder creeks. Though it’s sure that the majority will be eaten by other fish, it’s likely that enough will survive to have a major impact on the fishery in the future, not only with anglers catching the stocked fish, but with their contribution to the gene pool. Florida bass are noted for growing faster and reaching much larger sizes that the northern-strain bass that are found naturally in the TVA lake system. Florida strain fish stocked in some California lakes have exceeded 20 pounds in recent years, and they regularly produce fish of 13 to 15 pounds from Texas lakes. Pure Florida’s are found mostly from Gainesville, Florida, southward–those in the northern part of the state are primarily intergrades with northern strain bass, biologists say. Carter said he’s hopeful that the Lake Guntersville Conservation Group can become a continuing funding source for added stocking in the future, with donations allowing restocking every two to three years. The pure-strain Florida fish are obtained from a Montgomery hatchery that specializes in raising them for stocking in private ponds nationwide. Visit the Lake Guntersville Conservation Group Facebook page here. 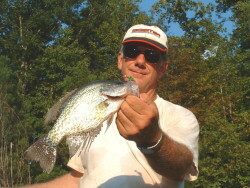 Carter, who is an active fishing guide on the lake, can be contacted at 423-802-1362. This entry was posted in Bass Fishing, Conservation on July 2, 2017 by ronniegarrison.